The great musician seeks only music, the poet poetry, the painter painting – Godard seeks only cinema. Jean-Luc Godard is, unquestionably, one of the most innovative and searching image-makers in the history of contemporary art. Godard always searches out new paths of creativity, thereby extending our understanding of the image. Irrespective of the medium – film, video, writing or television – Godard’s dazzling, multifaceted oeuvre suggests someone who is always prepared to start from zero in order to make sense of the multiplying, mutating signs around him. Godard is prepared to think aloud, to stutter, and see what exactly is taking shape in front of him. It is primarily Godard’s inventive, transgeneric experimentation which has shaped my own work as a video-essayist – not to mention my life as ’60s-formed cinephile. New powers of enunciation are central to Godard’s oeuvre. Television, in particular, represents for him new ways of seeing and hearing, new modalities of composition and decomposition (accelerating and slowing down the image), new strategies of mise en scène. Television, alias ‘video’ or the ‘electronic image’, signifies for him an unexplored potential for locating new sites in the image. Video is a whole way of being and thinking, as Philippe Dubois has argued (2) – a way of writing electronically with images and sounds about image and sound, of posing ethical, historical and theoretical questions about art, cinema, culture and society. Video represents a way of breathing through, and being intimately associated with, images – a means always within one’s reach. Godard’s supple ability to locate new images and sounds in the in-between spaces of cinema, video and photography suggests a markedly plural form of audio-visual writing. This is a major contribution to the hybrid intertextuality characterising today’s new media. With Godard’s major essay-videos like Scénario du film Passion (1982), Soft and Hard (1986) – both made in collaboration with Anne-Marie Mieville – and the Poe-inspired Puissance de la parole (1988), we are at the forefront of new anti-binary forms of electronic and digital mass communication. These essay-videos, from Six fois deux/Sur et sous la communication (1976) and France/tour/detour/deux/enfants (1977-78) to Histoire(s) du cinéma (1989-99), constitute Godard’s notable ‘between method’ (as Deleuze described it) of image-making. (5) The ‘writerly’ attributes of the highly elastic video medium are ideal for Godard and other artists including Robert Cahen, Thierry Kuntzel, Chris Marker, Steve Fagin and Irit Batsry who seek to construct a Mallarmé-influenced approach to electronic image-making. These artists have in common a sustained concern to explore the idea of vidéo-stylo writing (following Alexandre Astruc’s concept of the caméra-stylo in cinema) in postmodern techno-creativity. This is a highly self-questioning, non-conclusive kind of electronic writing, uncertain of its own authority; it stops and starts in an intermittent narrative fashion, weaving a trans-generic hybrid. Essentially this form of videography is indebted to Michel de Montaigne’s concept of the literary essay as well as to autobiography and the self-portrait: video as a personal, intimate cinema, trembling with experimental risk-taking, crossing generic boundaries without need of a passport. The film/video artist is a ‘go-between’ among cinema, literature, the visual arts and new media. Using video collage as an elliptical, fragmentary mode of image and sound writing exemplifies a ‘Northwest passage’ aesthetic (to adopt Michel Serres’ term). (6) This is a discursive, transmedia view of cultural production that criticises the dualistic constraints of modernism and official culture. Equally, it endeavours to capture the polyphonic indeterminancy of the modern essay form (as exemplified by Theodor Adorno, Roland Barthes, John Cage and Friedrich Nietzsche). In Godard’s case, vidéo-stylo writing permits him to transcribe rigorously and subtly his inner thoughts and feelings, thus formulating new fictions, new strategies of presenting information, new means of addressing the viewer. Perhaps the most recognisable textual trope of Godard’s art is the mise en scène of direct address: Godard’s self-reflexive voice questioning the work at hand, its fictionality and cultural or production features. For me, this links Godard’s films and videos to Cocteau’s Orphic, autobiographical cinema of human creativity, with its sinuous, narrating voice and wondrous, neon-like, astrological drawings. Godard’s presentation of the act of seeing and hearing his own work as it takes shape before him typifies an oblique image-writing, reflecting the wisdom of Montaigne’s words: “The world is but a perennial movement. All things in it are in constant motion (…) I cannot keep my subject still (…) I do not portray being, I portray passing.” (7) This is evident, for instance, in Scénario du film Passion, where Godard suggests that images are meant to render the invisible visible. Godard’s stirring studio discussion, taking place in front of his large TV screen (the “white beach”), comprises a grand search for the function and reality of today’s images, predicated on the dictum “voir-recevoir” (see-receive). Referring to Scénario, Jean-Louis Leutrat persuasively argues how for Godard, in a fleeting and engimatic moment, “the relationship between the image to be made and the image already made” contains the trace which belongs to the past. (8) It is a prefigurative fragment. What makes the history of cinema possible, Godard maintains, is that there remain images which embody its traces, and these traces mysteriously resemble us. Godard is thus an author who needs to create cinema and video as a continuous dialogue, a theatre of memory, infusing the image with language and quotations. All four modalities of Godard’s essayistic collage style have in their respective ways impacted on my own oeuvre, especially the second and third. Born almost beneath a Claude neon milk bar sign, I have long been fascinated with the idea of cinema, video or installation as writing: this phantasmatic notion has haunted me since the ’60s. Cocteau, Chris Marker and Orson Welles stand alongside Godard in this vital context. As a child at Tempe in the ’50s, I was intrigued by signwriters plying their art on our large milk bar window advertising the week’s discount bargains. To see their tools of trade in silent action forging a calligraphy of signs onto the window pane was an enchanting spell. As a spectacle it would later be uncannily echoed in Henri-Georges Clouzot’s Le Mystère Picasso (1956) which I saw in the late ’60s – when, for a moment, my childhood signwriters morphed into Picassos. Like many of my cinephile peers of the period, when I first encountered Godard’s A bout de souffle (1960) I was dazzled by its fresh inventiveness. What was this comet that indelibly scorched our lives with its jazzy editing rhythms, natural light spills, handheld camera and staccato jump cuts? This film boldly signalled to the world, with its experimental and playful intertextuality, a radical questioning of film narrative and spectatorship. Ever since, I have been enthralled by Godard’s relentless interrogation of cinema’s past and future. One knew instinctively from the opening moments of A bout de souffle that our understanding of cinema would be inextricably linked to Godard’s subsequent works. It is no exaggeration to say that one was either for or against Godard in the ’60s and early ’70s. Bernardo Bertolucci’s candid observation, “we all wanted to be Jean-Luc Godard”, (10) expressed the mythic sway Godard had on film culture in that era. Godard has always been a visionary, paving a way for many of us in the era when film and video rapidly began blurring into each other. Godard has shown us that it is possible to make films and still write about them as if (as David Thomson aptly puts it) they are “part of the same conversation.” (11). This facet of Godard’s art and life has been particularly important for me. 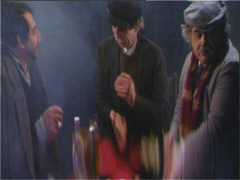 It was first glimpsed in his films, then subsequently in the video and TV works, but also in his collected film criticism, Godard on Godard (12) – a Joycean collage of autobiography, puns and gnomic utterances which many of my ’60s generation carried around, day and night, like a thumb-worn roadmap to the cinema (especially American genre cinema). Godard, time and again, has demonstrated that films and videos can be works of criticism. Godard’s oeuvre has been a constant source of intertextual inspiration for my own artistic work. My major videotapes and installations, Museum of Fire (1991, with sections by Chris Caines and David Haines), Night Sky (1995), Autumn Song (1998) and Album Leaves (1999) incorporate video, film, photography, neon and new media. Like many artists working in the audiovisual essay form, I regard video as a cross-disciplinary medium. I have attempted to excavate new sites in the image in order to produce a hopefully intricate and moving meditation on image-making itself. I have been drawn to those artists, filmmakers, writers, thinkers, videomakers and new media artists who are prepared to engage in the expressive and innovative possibilities of transgeneric experimentation. My examplars include Godard, Barthes, Cage, Serres, Deleuze, Woody and Steiner Vasulka, Man Ray, Yvonne Rainer, William Burroughs and Kathy Acker, all whom have contributed to today’s critical vocabulary of cross-disciplinary art and thought. When the American computer animator/filmmaker Ed Emshwiller asked Godard why he didn’t bother with specific technological questions, he replied: “Video, film, writing – it’s all the same to me”. (14) This ‘Northwest passage’ image-making contests our tunnel-vision fixities about art, ourselves and our socio-cultural institutions – located at the edge, always in the midst of things, incomplete. In the late ’70s I did a short video production course at the Australian Film, Televison and Radio School. I became interested in video as an extension of my passion for cinema. I was quite intrigued, as the ’80s progressed, by video and cinema as a nonlinear form of writing – a choreography of expression with images and sounds. (Even when I perform in my videos I see myself as a caméra-stylo traversing cultures, genres and borders.) Video allowed me to explore complex questions of aesthetics, culture, space, memory and time. As a collage art form, it gave me the opportunity to ‘collide’ cinema with literature, painting with cultural theory, or dance with poetry, producing multiple vistas of imaginative and generic possibilities. For example, in Autumn Song, an autobiographical performance video, I deal with my memories as a child of Greek parents living in the Tempe milk bar. Its collage and essayistic structure enabled me to explore intricate, allusive ideas of postcolonial dislocation, cultural mistranslation and transmigratory spaces. The premise of the video is the powerful impact an uncle of mine (Uncle Manoli, who never left the Greek island of Kythera) had on me as a child. Though I met him in the mid ’70s in Kythera (a place which has inspired diverse figures including Baudelaire, Watteau, Bloch, Debussy and Angelopoulos), the spectre of Uncle Manoli shaped my imagination as a child. My parents and relatives warned me about him, so that I would not turn out to be like him, a infamously lazy, misanthropic writer who spent his time playing cards in taverns. As a baroque self-portrait, Autumn Song also questions the logic of trying to make sense of one’s bi-cultural childhood life. It addresses the many conflicts, contradictions and transgressive silences of my past, in an attempt to understand my ongoing life as a hyphenated being: Greek-Australian, artist-writer. The video’s studio and open-air performances, landscapes, numerous reconfigured images and quotes (from Man Ray, Buster Keaton, Georges Franju, Max Ernst, Maya Deren, etc) suggest the condition of the postcolonial alien caught between places in postwar Australia. I often use these quotes and references to past filmmakers, visual artists, videomakers, writers and thinkers as an antidote to the underlying, institutionalised cultural amnesia that impacts on electronic media’s history. Godard’s art falls like a shadow across my videotapes, installations and writing – whether it is the ‘Cain and Abel’ neon sign of Album Leaves alluding to Godard’s film Sauve qui peut (la vie) (1979); the F. W. Murnau quote as a Godardian text written across my son playing me as a child in the backyard of the Tempe milk bar in Autumn Song; or cinema history as a subject in my various videos. Godard has given us all a profound authorial and intertextual capacity to write with and in images. His use of video suggests an artist who is seeking the yet unchartered creative sites within the image. For Godard, video is a ‘live’ medium of images and sounds, where seeing is thinking and thinking is seeing. He leaves cinema and video as open questions. He remains, as always, one of the chief voyagers of the image. Jean Douchet, French New Wave (New York: Distributed Art Publishers, 1999), p. 243. Philippe Dubois, “Video Thinks What Cinema Creates”, in Raymond Bellour and Mary Lea Bandy (eds), Jean-Luc Godard: Son + Image 1974-1991 (New York: The Museum of Modern Art, 1992), pp. 169-185. Gilles Deleuze, “Three Questions About Six fois deux“, in Bellour and Bandy (eds), pp. 35-41. Michel Serres, “Northwest Passage,” in Timothy Simone, et, al (ed), Oasis (New York: Semiotext(e), 1989), p. 104. Michel de Montaigne, quoted in Michael Renov, “Lost, Lost, Lost: Mekas as Essayist”, in David E. James (ed), To Free the Cinema (Princeton: Princeton University Press, 1992), pp. 217. Jean-Louis Leutrat, “Traces that Resemble Us: Godard’s Passion“, Substance no. 51, pp. 36-51. Raymond Bellour, “(Not) Just An Other Filmmaker,” in Bellour and Bandy (eds), pp. 219-220. Cited in Michael Temple, “It Will Be Worth It”, Sight and Sound, Vol 8 No 1 (1998), p. 21. David Thomson, “That Breathless Moment”, Sight and Sound, Vol 10 No 7 (2000), p. 31. Tom Milne (ed), Godard on Godard (London: Secker and Warburg, 1972). Godard quoted in Constance Penley, The Future of an Ilusion (Minneapolis: University of Minnesota Press, 1989), p.104.